The old theatre was destroyed by fire in 1808, but the Prince Regent provided much of the financial assistance needed to remodel the building. 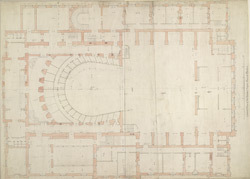 This is a scale plan of the Theatre Royal as erected by Robert Smirke. Opened in 1809, it was modelled on the Temple of Minerva at Athens. Ticket prices were raised to recoup some of the building costs, precipitating the 'Old Price Riots', which continued for 61 nights until the management lowered prices again.